This week, both bargaining units took time to meet and discuss their perspectives with students. We thank Dr. Jason Childs and Dr. Marc Spooner from URFA and Dr. Vianne Timmons and Dr. Tom Chase from the University administration for taking the time to talk to concerned students. This is a great first step, but there is still much more work to do for you, the students. 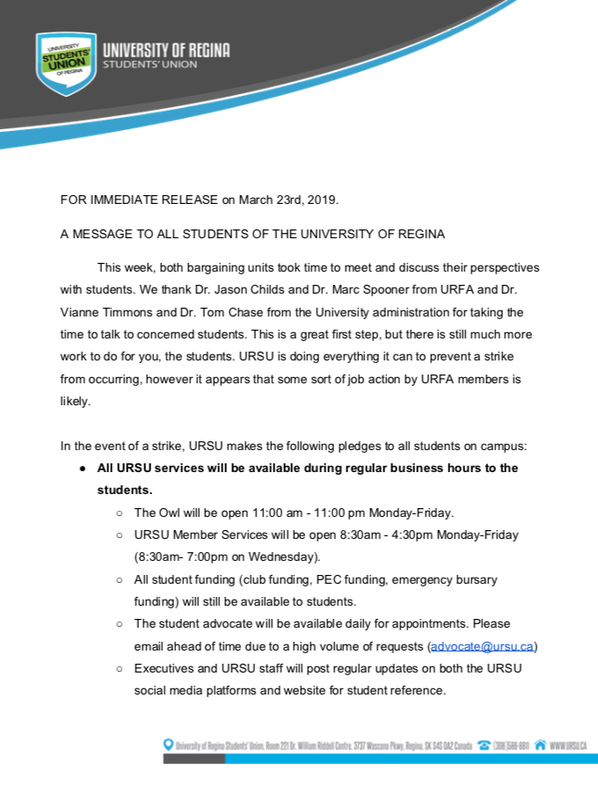 URSU is doing everything it can to prevent a strike from occurring, however it appears that some sort of job action by URFA members is likely. 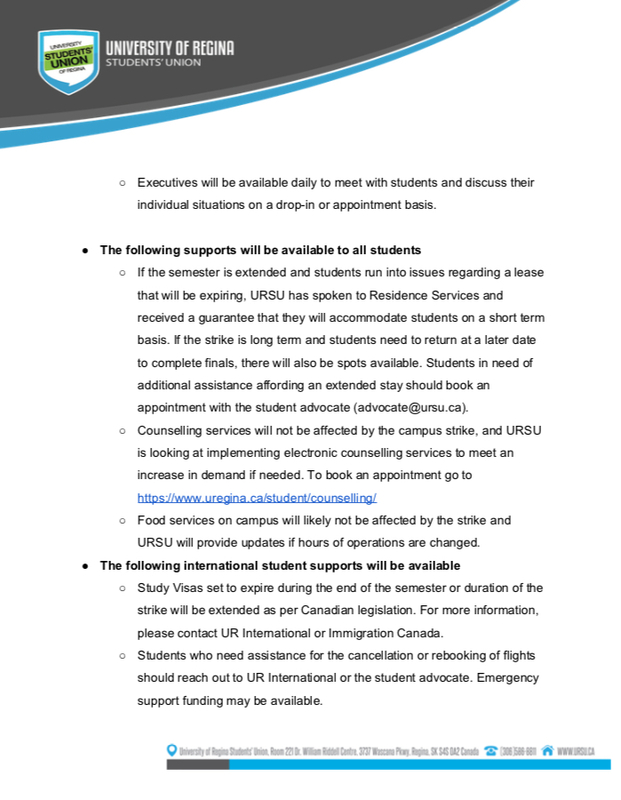 All URSU services will be available during regular business hours to the students. The Owl will be open 11:00 am – 11:00 pm Monday-Friday. URSU Member Services will be open 8:30am – 4:30pm Monday-Friday (8:30am- 7:00pm on Wednesday). All student funding (club funding, PEC funding, emergency bursary funding) will still be available to students. Executives and URSU staff will post regular updates on both the URSU social media platforms and website for student reference. Executives will be available daily to meet with students and discuss their individual situations on a drop-in or appointment basis. If the semester is extended and students run into issues regarding a lease that will be expiring, URSU has spoken to Residence Services and received a guarantee that they will accommodate students on a short term basis. If the strike is long term and students need to return at a later date to complete finals, there will also be spots available. Students in need of additional assistance affording an extended stay should book an appointment with the student advocate (advocate@ursu.ca). Food services on campus will likely not be affected by the strike and URSU will provide updates if hours of operations are changed. Study Visas set to expire during the end of the semester or duration of the strike will be extended as per Canadian legislation. For more information, please contact UR International or Immigration Canada. Students who need assistance for the cancellation or rebooking of flights should reach out to UR International or the student advocate. Emergency support funding may be available. 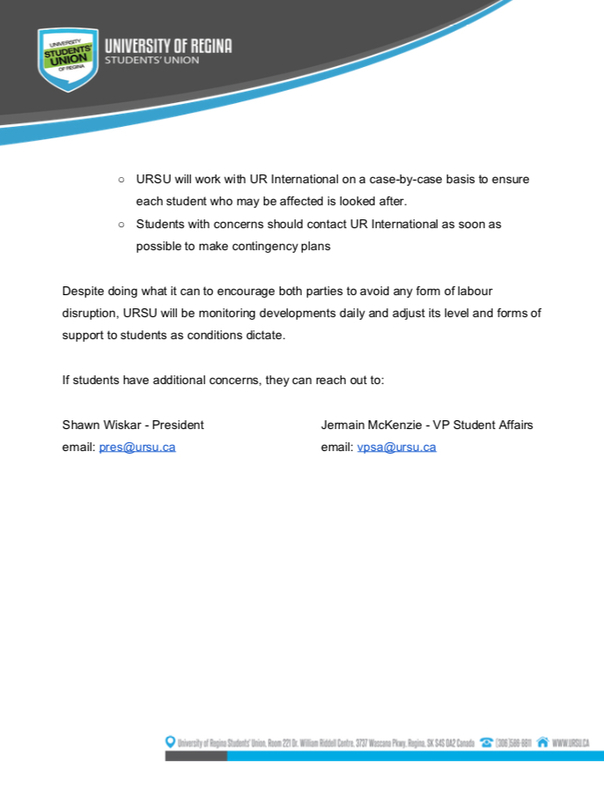 URSU will work with UR International on a case-by-case basis to ensure each student who may be affected is looked after. Despite doing what it can to encourage both parties to avoid any form of labour disruption, URSU will be monitoring developments daily and adjust its level and forms of support to students as conditions dictate.